See all images from the race here. 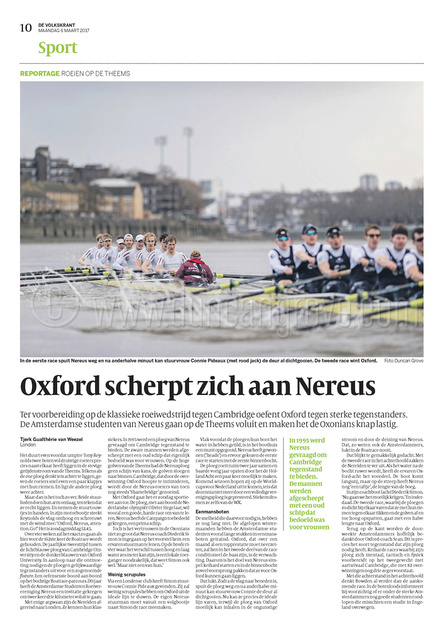 De Volkskrant, Holland’s highest circulation newspaper sent their staff reporter Tjerk van Weezel to cover the “Fixture” (race) between their national rowing crew and Oxford’s Blue crew. Covering the same Putney to Mortlake River Thames course as the Universities Boat Race due to take place in four weeks time, this was a useful rehearsal for Oxford. Obviously, De Volkskrant also needed an experienced photographer to shoot the race. Who better to turn to than Duncan? The organizers did not provide a press launch on this occasion but Duncan was able to use contacts to secure the services of a skiff and driver, and thus he and Tjerk were able to follow the race from the water.